An attractive selection of the finest cheeses. The Artisan Cheese basket contains 5 carefully selected cheeses, a selection of tasty crackers and a bottle of Classico Bardolino. 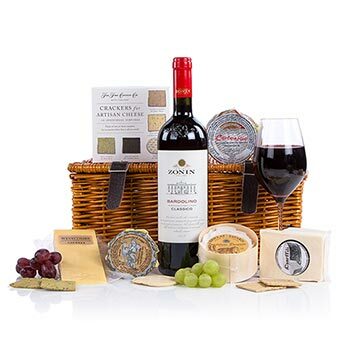 The perfect pairing for cheese and wine lovers this Christmas. Disclaimer Please note that for delivery on Saturday the delivery fee is increased to £10.99.